Take a complicated Russian opera. Add characters that are humans playing furry woodland creatures. Set it in a world of cardboard and tape and glue, and you have the makings of The Cunning Little Vixen, produced by Boston Opera Collaborative in February, 2011, at the Mass Art Tower Auditorium. I was hired as the production manager for the show, but stepped up to design and build the puppets when we needed the extra hands. It was not the first time I had built puppets for theatre, but marks the point at which I started marketing myself as a puppet designer. The little frog sings – we needed a simple construction for an opera singer who had never worked with puppets. The Hunter interacted with the little frog with sincerity! 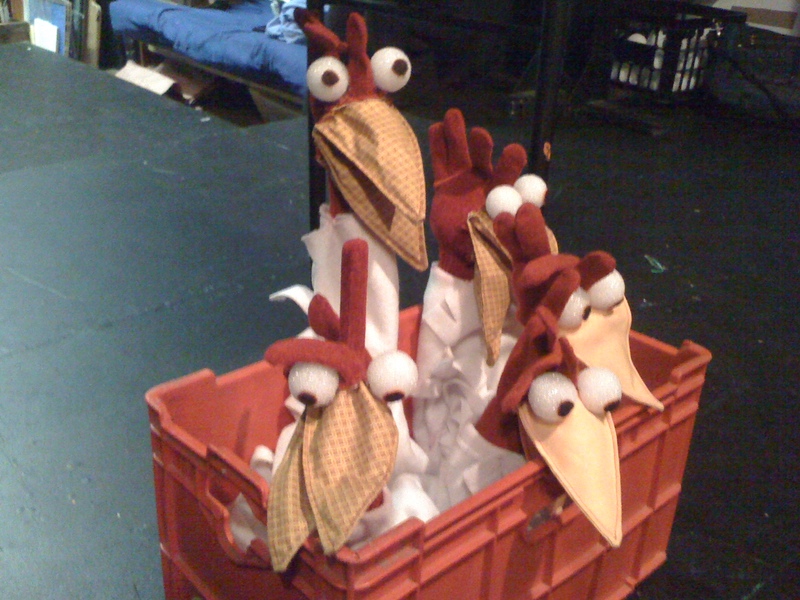 Above all the other puppets built for the show, the chorus of chickens became the favorite. They sang in unison, beaks moving together (to the credit of the puppeteers!). We fell so in love with them that they have gone on to live at Puppet Showplace Theatre, and have made special appearances at other events.